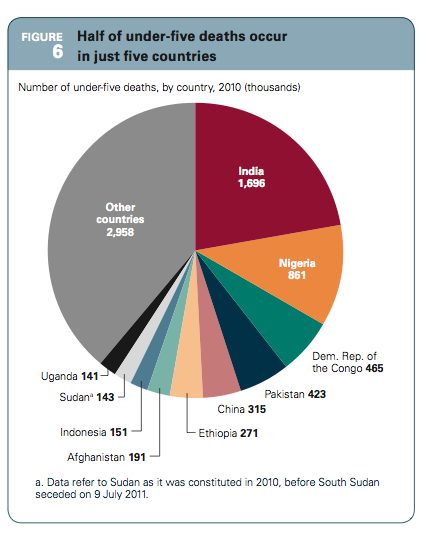 That according to the recently released 2011 UN report, “Levels and Trends in Child Mortality“. For a relatively small country of around 32 million inhabitants, Uganda gets a terribly large chunk of the pie, as seen below (page 8 of the report). Uganda is the 10th largest contributor to child deaths worldwide. In Sub-Saharan Africa the average annual rate of reduction in under-five mortality has accelerated, doubling from 1990-2000 to 2000-2010. Six of the fourteen best-performing countries are in Sub-Saharan Africa, as are four of the five countries with the largest absolute reductions (more than 100 deaths per 1,000 live births). The six best performers for a reduction in the rate of mortality are Madagascar, Malawi, Eritrea, Liberia, Niger, and Tanzania. The countries with the greatest reduction in child deaths in absolute terms are Niger, Malawi, Liberia, and Sierra Leone. What are they doing right? Oh my goodness Nicole, I’m so etecxid you’ve written a post about Invisible Children! Every year, I teach my 5th grade students about the civil war that has torn Uganda apart and how these children have been forced to be soldiers. It’s through a program called Books of Hope where they learn about this tragedy and then create educational books for the kids living in Uganda. It’s such a cool program!